Each year, approximately 300 middle and high school students from throughout the Upper Peninsula (Region 1) compete in 46 different Science Olympiad academic events. More than 100 volunteers, most of whom are affiliated with Northern Michigan University, help to make this tournament possible. Science Olympiad competitions have been sponsored by the Glenn T. Seaborg Mathematics and Science Center at Northern Michigan University since 1987. 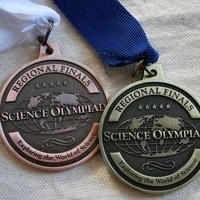 Learn more about Science Olympiad here: Michigan Science Olympiad and National Science Olympiad. To volunteer for this event, please contact Renee Jewett, Region 1 Director for Michigan Science Olympiad, at the Seaborg Center.